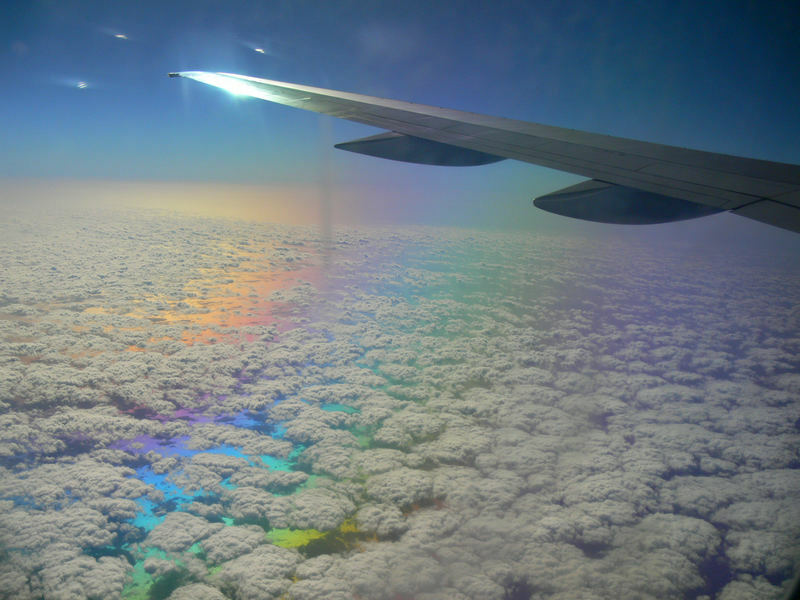 Patrice Touhar took this photograph through the window of an airplane using a polarization filter and so made these polarization colours appear. Under these circumstances, the light gets split up into two coherences of polarized components which travel through the window at different speeds. This causes a phase difference the amount of which depends from the wavelength. This means that the polarization gets transformed once into a linear polarization of a different direction than the origin for a certain colour, and into a circular polarization for another colour (Lissagiu interference of two waves). As the polarization is now dependent from the colour, the colours appear when a polarization filter is used, no matter if this filter is placed in front of the eye or in front of a camera. 2. The window is made of plastic. In this material there are mechanical tensions which cause a double refraction. 3. There is a polarization filter in front of the camera. The last condition is not necessary if you look at the window from an acute angle. Then the light becomes already polarized by the refraction. In this case there is no filter necessary to see the colours. However, the colours you can see under this circumstance are fainter than the colours seen through the polarization filter because refraction polarizes only a part of the light. You can also find another observation of this kind in this former thread. Posted on May 26, 2011, in observations, polarization and tagged polarized, window colours. Bookmark the permalink. 2 Comments. Is very intersting that some airplanes may have polarization colours window and It would be a an advantage for the passegers. Hello Great informative article! Thanks so much for sharing your wealth of information. I certainly appreciate the effort! keep up the good work!